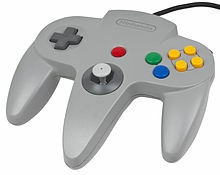 The Nintendo 64 controller is an "m"-shaped controller with 10 buttons (A, B, C-Up, C-Down, C-Left, C-Right, L, R, Z, and Start), one analog stick in the center, a digital directional pad on the left hand side, and an extension port on the back for many of the system's accessories. Initially available in seven colors (gray, yellow, green, red, blue, purple, and black), it was later released in transparent versions of said colors (except gray). The Controller Pak[a] is the console's memory card, comparable to those seen in the PlayStation and other CD-ROM-based video game consoles. Certain games allow saving of game files to the Controller Pak, which plugs into the back of the Nintendo 64 controller (as do the Rumble and Transfer Paks). The Controller Pak was marketed as a way to exchange data with other Nintendo 64 owners, since information saved on the game cartridge could not be transferred to another cartridge. It is plugged into the controller and allows the player to save game progress and configuration. The original models from Nintendo offered 256 kilobits (32KB) battery backed SRAM, split into 123 pages with a limitation of 16 save files, but third party models have much more, often in the form of 4 selectable memory bank of 256kbits. The number of pages that a game occupy vary — sometimes using the entire card. It is powered by a common CR2032 battery. A Controller Pak is initially useful, and even necessary for the earlier Nintendo 64 games. Over time, the Controller Pak lost popularity to the convenience of a battery backed SRAM (or EEPROM) found in some cartridges. Because the Nintendo 64 uses a game cartridge format that allows saving data on the cartridges themselves, few first party and second party games use the Controller Pak. The vast majority are from third-party developers. This is most likely due to the increased production and retail costs which would have been caused by including self-contained data on the cartridge. Some games use it to save optional data that is too large for the cartridge, such as Mario Kart 64, which uses 121 pages (almost the entire cartridge) for storing ghost data, or International Superstar Soccer 64, which uses up the entire cartridge's space for its save data. Tony Hawk's Pro Skater uses 11 pages. Quest 64 and Mystical Ninja Starring Goemon use the Controller Pak exclusively for saved data. The Japan-only game Animal Forest uses the Controller Pak to travel to other towns. Following the 1996 Christmas Shopping Season, Next Generation reported "impressive sales of the memory pack cartridges despite the lack of available games to take advantage of the $19.99 units." The Jumper Pak[b] is a filler that plugged into the console's memory expansion port. It serves no functional purpose other than to terminate the RAMBUS bus in the absence of the Expansion Pak. This is functionally equivalent to a continuity RIMM in a RAMBUS motherboard filling the unused RIMM sockets until the user upgrades. Early Nintendo 64 consoles (prior to the Expansion Pak's release) came with the Jumper Pak included and already installed. Jumper Paks were not sold individually in stores and could only be ordered individually through Nintendo's online store. The system requires the Jumper Pak when the Expansion Pak is not present or else there will be no picture on the TV screen. "Expansion Pak" redirects here. For the Nintendo DS memory expansion unit, see Nintendo DS Memory Expansion Pak. The 4 MB memory Expansion Pak. The Expansion Pak[c] consists of 4 MB (megabytes) of random access memory (RAM)—which is RDRAM, the same type of memory used inside the console itself—increasing the Nintendo 64 console's RAM from 4 MB to 8 MB of contiguous main memory. Originally designed to accompany the 64DD disk drive expansion peripheral for its larger multimedia workstation applications, the Expansion Pak was launched separately in Q4 1998 and then bundled with the 64DD's delayed 1999 launch package. The Expansion Pak is installed in a port on top of the console and replaces the pre-installed Jumper Pak, which is simply a RAMBUS terminator. It was bundled with an "ejector tool" (NUS-012) for helping remove the original Jumper Pak. Game developers can take advantage of the increased memory for several purposes, including greater visual appeal. The Expansion Pak is required in order to run three cartridge games, Donkey Kong 64, The Legend of Zelda: Majora's Mask, and Perfect Dark. It is also required for all 64DD software. Capcom's Resident Evil 2 uses the Expansion Pak for increasing the visual details of environments and monsters, and Perfect Dark has limited gameplay options when the Expansion Pak is not present. Supporting games usually offer higher video resolutions or higher textures or higher color depth. For example, the Nintendo 64 all-remade version of Quake II features higher color depth but not a higher resolution when using the Expansion Pak. It is used in StarCraft 64 to unlock levels from the popular Brood War add-on for the PC version of the game. Many games such as Castlevania: Legacy of Darkness and Indiana Jones and the Infernal Machine optionally use the Expansion Pak to add a high resolution 640x480 display mode for games, while other games see the benefit of a smoother frame rate. Certain games, such as Duke Nukem: Zero Hour, offer the user the choice between increased resolution or increased frame rate. The Expansion Pak is available separately as well as bundled with Donkey Kong 64. In Japan, the Expansion Pak is additionally bundled with Zelda: Majora's Mask and Perfect Dark, though the games have been also available separately in other regions. Space Station Silicon Valley is known to potentially crash on startup if the Expansion Pak is present..
IGN celebrated the Nintendo 64 industry's methods in launching and supporting the Expansion Pak, for making a high impact accessory with "immediate and noticeable" effects but which is nonetheless mostly optional. Aidyn Chronicles: The First Mage No The Expansion Pak is required for the "High Quality" graphics setting. Castlevania: Legacy of Darkness No The Expansion Pak enables the option to turn on "Hi-Res" mode. Command & Conquer No The Expansion Pak is required for high-resolution map textures. Daikatana No Allows for a "hi-res" graphics mode, which changes the game to a widescreen view but has little noticeable effect on graphics. Donkey Kong 64 Yes Used to enhance graphics and provide more expansive environments. Also prevents a game-breaking bug that would cause the game to randomly crash. Since Rare could not fix the problem, the Expansion Pak is packaged with the game. If the Expansion Pak is not used, a notice will be shown on screen, preventing the game from being played. Duke Nukem: Zero Hour No The Expansion Pak allows the player to choose between playing at high resolution or with a faster frame rate. Excitebike 64 No The Expansion Pak enables the option to turn on "Hi-Res" mode. Only the PAL version signifies its Expansion Pak compatibility on the box. F-1 World Grand Prix II No The Expansion Pak allows a full race replay. FIFA 99 No Allows for an unadvertised "Super High" resolution mode of 640×480. Gauntlet Legends No The Expansion Pak is required for 4 player multiplayer. Hydro Thunder No The Expansion Pak is required for 3 and 4 player multiplayer. International Superstar Soccer 2000 No The Expansion Pak is required for high-resolution textures; however, performance suffered as a result. Ken Griffey, Jr.'s Slugfest No Allows for hi-res gameplay. The Legend of Zelda: Majora's Mask Yes Utilized to increase texture detail, remove fog that is prevalent in Ocarina of Time, and increase number of on-screen models as well as effects. NBA Jam 2000 No Only the PAL version signifies its Expansion Pak compatibility on the box. Perfect Dark Required for story mode The Expansion Pak is required for the single player, co-operative and counter-operative campaigns, as well as most multiplayer features. It also allows hi-res mode. Pokémon Stadium 2 No States "Expansion Pak Detected" on the Start screen if one is being used. Increases the resolution to 640×480 pixels. Quake II No Uses the Expansion Pak for extra graphical detail. Rayman 2: The Great Escape No Increased video resolution. Re-Volt No Unlocks Medium Resolution mode (doubles resolution); cheat code "FLYBOY" enables higher quality. Resident Evil 2 No Increased video resolution and texture detail. Road Rash 64 No The Expansion Pak increases the framerate from 30 Hz to 60 Hz. San Francisco Rush 2049 No The Expansion Pak is required for Track 6, the Advanced Circuit, Changeable rims, and music during Arcade races. Shadow Man No Improves the texture quality. South Park No Enables hi-res mode, increases frame rate in lo-res mode. StarCraft 64 No The Expansion Pak is required for the Brood War missions and the two player split-screen mode. Star Wars: Episode I: Battle for Naboo No Increases resolution to 640×480, greatly increasing picture sharpness. Star Wars: Episode 1 Racer No Enables hi-res mode, which runs at 640×480 pixels with higher-resolution textures. Also increases the framerate in lo-res mode for smoother gameplay. Star Wars: Rogue Squadron No Increases the resolution to 640×480 pixels. The World Is Not Enough No Provides enhanced graphics and visual effects. Tony Hawk's Pro Skater 2 No Increases framerate, especially noticeable during multiplayer games. Turok 2: Seeds of Evil No The Expansion Pak is required for high-resolution map textures. Turok: Rage Wars No The Expansion Pak allows for hi-res textures, and slight screen resolution increase. The Rumble Pak[d] is an accessory which provides haptic feedback to the player by way of vibration. It is powered by two AAA batteries and connects to the controller's expansion port. It was released in 1997 for the new game Star Fox 64 or Lylat Wars, with which it was originally bundled. The Transfer Pak[e] is an accessory that plugs into the controller and allows the Nintendo 64 to transfer data between its own games and Game Boy or Game Boy Color games. The Transfer Pak has a Game Boy Color slot and a part that fits onto the expansion port of the N64 controller. It was included with the game Pokémon Stadium, as the game's main feature is importing Pokémon teams from Game Boy titles. Pokémon Stadium and Pokémon Stadium 2 are games that rely heavily on the Transfer Pak. Pokémon Stadium also includes a "GB Tower" mode for playing Pokémon Red, Blue, and Yellow directly on the Nintendo 64 via a built-in Game Boy emulator (which includes unlockable "Doduo" and "Dodrio" modes which speed up the game by a factor of 2 and 3, respectively). The Stadium games are the exception, as normally it is not possible to actually play Game Boy games on the Nintendo 64 with the Transfer Pak, as is possible with the Super Game Boy on the Super Nintendo Entertainment System. The Japanese version of the Game Boy Camera can be connected to the Mario Artist series. Both Mario Golf and Mario Tennis make use of the Transfer Pak. Rare's Perfect Dark was initially going to be compatible with the Transfer Pak in order to use pictures taken with the Game Boy Camera to create characters with real-life faces, but this function was removed from development after the attacks at Columbine High School and a wave of anti-violent video game sentiment; the Transfer Pak is usable only in combination with the Game Boy Color version of Perfect Dark for unlocking bonuses. The Wide Boy 64 AGB, the last version of the Wide Boy 64 that could play Game Boy Advance games. Developed by Intelligent Systems, the Wide-Boy64 is a series of adapters similar to the Super Game Boy that was able to play Game Boy games. The device was never sold in retail to general consumers and was only provided exclusively to developers and the gaming press. Two major versions of Wide-Boy64 were released, the GBC which could play Game Boy and Game Boy Color games, and the updated GBA which could also play Game Boy Advance game paks, in a similar fashion as the Game Boy Player does with Game Boy Advance games and the Super Game Boy with original Game Boy games. It also allowed the gaming press to capture screen shots more easily. Like the Super Game Boy and Game Boy Player, the game screen itself is surrounded by a template mimicking the appearance of the portable system. This device was used for final matches at the Pokémon League Summer Training Tour '99. It was not a consumer product as only developers and magazines could purchase one directly from Nintendo at a cost of $1400 USD a piece. The Canadian children's game show Video & Arcade Top 10 used Wide-Boy64 adapters so contestants could play Game Boy titles on some later episodes. The S-Video Cable provides a better quality picture than composite RCA cables via the MultiAV port. The NTSC cable is identical to and compatible with earlier SNES (NTSC/PAL) and later GameCube (NTSC-only) S-Video cables. The first party NTSC Nintendo 64 S-Video cable sold by Nintendo, however, was not produced in PAL regions. The PAL Nintendo 64 does natively output S-Video (Luma/Chroma), but require a different cable to NTSC Nintendo 64 due to a design difference in most or all PAL motherboard revisions. Nintendo never released an official S-Video cable for the PAL console. Using an NTSC S-Video cable on a PAL console will usually produce over-bright, garish colors; or it may not produce any video image at all. Third party S-Video cables for both the NTSC and PAL consoles were produced, though it is important to note that many cheaper S-Video cables do not deliver a true S-Video signal, merely passing the composite video signal (the yellow plug of the standard red/white/yellow AV cables) through the S-Video plug. The 64DD (short for "Dynamic Drive", and subsequently "Disk Drive") is an official peripheral capable of reading and writing disks. The peripheral was initially announced in 1995, planned for release in 1997, and repeatedly delayed until its release in December 1999. It launched alongside a now defunct online service called Randnet. With nine games released, it was a commercial failure and was consequently never released outside Japan. The Mouse was only produced as a pack-in with Mario Artist for the 64DD. The mouse was developed to accompany the 64DD's GUI-based games and applications, such the Mario Artist suite and SimCity 64. It is known to work also with the regular Nintendo 64 game Mario no Photopi. [f] It was bundled with the 64DD's launch title, Mario Artist: Paint Studio and manufactured by Mitsumi. The VRU (Voice Recognition Unit). The VRU (Voice Recognition Unit) has only two compatible games: Hey You, Pikachu! and Densha de Go! 64. A VRU is included with every factory package of Hey You, Pikachu! and is required to play the game. Densha de Go! 64 does not require the VRU, and as such, they are sold separately. The peripheral consists of a ballast (NUS-020) connected to controller port 4 of the system, a microphone (NUS-021), a yellow foam cover for the microphone, and a clip for clipping the microphone to the controller (NUS-025, bundled with Hey You, Pikachu!) or a plastic neck holder for hands free usage (NUS-022, bundled with Densha de Go! 64). The VRU is calibrated for best recognition of a high-pitched voice, such as a child's voice. As a result, adults and teenagers are less likely to have their speech recognized properly by the VRU. VRUs are region dependent, and a USA region VRU cannot be used with Japanese games and vice versa (foreign region VRUs are not detected by the games). No VRU compatible game was launched in the EUR region (PAL, Europe), so there is no EUR-region VRU. A similar device was also released for the Wii called the Wii Speak. Nintendo released a first party cleaning kit for the Nintendo 64. It contains everything required to clean the connectors of the control deck, controllers, Game Paks, Rumble Paks, and Controller Paks. These accessories allow the Nintendo 64 and model 2 SNES (redesigned after the launch of the Nintendo 64) to hook up to the television through RF. It was primarily intended for customers with older televisions that lack AV cable support. Since the Nintendo 64 and model 2 SNES lack built-in RF compatibility, the modulator acts as a special adapter that plugs into the Nintendo 64's AV port to give the Nintendo 64 RF compatibility. The RF switch itself is identical in every way to the RF switches released for Nintendo's prior systems (the NES and the SNES) and can be interchanged if needed. This set was later re-released for the GameCube to give it RF capability. The cables intended for the GameCube will also work with the Nintendo 64 and SNES. The Euro Connector Plug is an adaptor packaged with European releases of the console, which converts RCA composite and stereo cable inputs to Composite SCART. A 28.8 kbit/s modem on a Nintendo 64 cartridge, formerly for use with the Randnet service and compatible 64DD games. Supplied with the Nintendo 64 Console to provide power to the Control Deck. An official compact keyboard for use with the Randnet service and compatible 64DD games. The cards are all 3.3V 2MB SmartMedia memory cards manufactured by Hagiwara Sys-Com. The Mario no Photopi game was bundled with an empty memory SmartMedia card for storing the user creations. An ear-clip that plugs into the Controller Pak slot of the controller to measure the user's heart rate. Manufactured by Seta and released only in Japan and compatible only with Tetris 64 where it will slow down or speed up the game depending on how fast the player's heart is beating. This device is similar to the Wii Vitality Sensor. A train controller compatible with just one game: Let's go by Train! 64. [s] It is similar to other controllers for the same game series on different platforms such as Dreamcast and PlayStation. Nintendo licensed A.L.S. Industries to make two types of black wooden system organizers. Both feature a plastic drawer, bearing a Nintendo 64 sticker, with slots designed to hold Nintendo 64 game cartridges, controllers, and controller paks. The larger of these two organizers holds up to 24 game cartridges, and is designed to hold the Nintendo 64 on top of the organizer. The larger organizer is also designed to work with Super NES consoles, game cartridges, and controllers. The smaller organizer holds up to 12 game cartridges. The Messenger Bag is a black bag made to carry on the left side of the body. It is branded on the front with the Nintendo 64 logo and name. It comes with zippered compartments on the outside and inside and with mesh pockets. It can only hold a few games and a controller. Nintendo licensed a Traveling Case—a black bag, with the Nintendo 64 name stitched on the front. Two plastic buckles on the front keep the bag closed. It is made to carry the Nintendo 64 system with controllers, games, and accessories. They also made a standard black backpack with the Nintendo 64 logo on the top and a zippered compartment on the front. A basic 35 mm camera, complete with a timer and flash. Official cameras have a Nintendo 64 logo on the front. They come in different colors such as blue and orange. Nintendo's original development environment for Nintendo 64 software is a card made by SGI containing a most of a Nintendo 64 console plus a software development kit (SDK), for self-hosted installation in an SGI Indy workstation. The second generation moved to a much cheaper partner model between a normal Nintendo 64 console and a PC, by providing a cartridge form factor holding flash storage with a cable connection to a PC. Nintendo officially licensed SN Systems to make the SN Systems dev kit and SN Maestro 64, the second generation of Nintendo 64 SDK in PC partner form to replace the Indy-hosted hardware solution. Unofficial kits include IS-VIEWER 64 and Partner 64. The Monegi Smart Pack is a collection of third party hardware and software which can be used to do real-time development while the game is running on the console. Through the decades, many unlicensed third party peripheral devices provide many consumer-friendly alternative storage mediums for retail Nintendo 64 consoles, bypassing console security for the purpose of development or for users making backups of game cartridges and save data. The Doctor V64 is a CD-ROM peripheral designed by Bung Enterprises Ltd and released in 1996. It plugs into the Nintendo 64's underside expansion slot, and uses a lockout-bypass adaptor that fits into the cartridge port into which any retail cartridge is inserted for use of its lockout chip by proxy. The Doctor V64 Jr. is a cheaper, condensed version that fits into the cartridge port and provides a parallel port connection to a PC. Bung made the DX 256 Super Game Saver which stores 256 battery EEPROM save states, and the DS1 Super Doctor Save Card. The CD 64 is a CD-ROM drive developed by UFO/Success Company. Mr. Backup Z64 designed by Harrison Electronics, Inc. is a ZIP drive peripheral for creating writable backups and performing playback of any Nintendo 64 cartridge. The modern Everdrive 64, ED64 Plus, N64 Neo Myth, and 64Drive use SD cards for mass storage of ROM image files or USB cables to connect to a PC for transfer. Tilt Pak — A combo Rumble Pak and Motion sensor made by Pelican. GameShark — An unlicensed cheat device made by Interact in two versions. The first version had an LED display that would count down 5 seconds upon turning the system on. The period in the display would be lit while playing to show that the unit was functioning. There is a slot on the back of the unit for an expansion card that was never made. The second version (known as the "Pro" series, versions 3.2 and up) had a SCSI or parallel port on the back for connecting to a computer for downloads. It also featured a cheat search function. Version 3.2 had a similar LED display as the earlier versions. This feature was removed in version 3.3. GameShark cards (or Action Replay cards in Europe) could be used to access content that would normally be inaccessible if a game is played normally without the card. SharkWire Online — An InterAct GameShark with modem and PC style serial port for keyboards. Allowed emailing and Game Shark updates through the now discontinued sharkwire.com dial-in service. GB Hunter — The GB Hunter is one of two Nintendo 64 items released by EMS Production Ltd., the other being the N64 Passport. It is a Game Boy emulator for the Nintendo 64, similar to the first-party Super Game Boy for the SNES. A Nintendo 64 game is plugged into the back of the item and a Game Boy cartridge is plugged into the top. Like the Super Game Boy, it connects to the Nintendo 64's cartridge slot and requires a Nintendo 64 boot cartridge plugged into its back, and allows the user to play Game Boy games on it. There is also a cheating device programmed into it, called the "Golden Finger" (like the Game Genie or Game Shark). Holding the "L" and "R" buttons simultaneously will cause the game to freeze at that point and the GB Hunter's Menu to appear. The Game Screen can be maximized or minimized, from the Main menu, allowing the player to see the game full screen. The GB Hunters color palette can also be changed from the menu, to view the game in a variety of the 3 different colors. Unlike on the Super Game Boy, the game sounds while being played on the GB Hunter are not emulated. Rather, users are subjected to the theme song of the GB Hunter, which loops endlessly. High Rez Pack — Mad Catz's less-expensive version of the Expansion Pak. There were reports of overheating due to inadequate cooling/venting, and the unit suffered from poor build quality. N64 Passport — Adapter and cheat device allowing players to play games from different regions, with a few exceptions. Memory Card Comfort by Speed-Link — A sort of Controller Pak with four separate memory areas, and 123 pages each, selectable via a small switch. Battery-free Rumble Paks — Late in the Nintendo 64's market presence, a few third-party companies made Rumble Paks that, instead of requiring batteries to work, draw power from the system. Tremor Pak - A third-party rumble pack. The Nyko Hyper Pak Plus - contains internal memory as well and a rumble feature and allows the user to adjust the amount of feedback between "hard" and "too hard". Advanced Controller - A Mad Catz gamepad with the same form and controls as the standard Nintendo 64 controller, except that it adds a turbo button. Mad Catz Steering Wheel - A set consisting of an analog steering wheel that turns 270 degrees, two foot pedals, and a stick shift. Used for racing/driving games. Power Wheel - A steering wheel with foot pedal module produced by Game Source. V3 Racing Wheel - A steeling wheel with foot pedals produced by Interact. It includes an expansion port which does not support the Rumble Pak, due to the risk that it would grate on the player's crotch. Flight Force Pro 64 - A flight stick from InterAct. Arcade Shark - An arcade-style joystick controller from InterAct, with slow motion and auto-fire buttons. Tristar 64 - A third party adaptor making it possible to play NES and SNES games on Nintendo 64. The device features three built-in cartridge slots, one for each cartridge type, and it plugs into the console's existing cartridge slot. ^ Japanese: コントローラパック, Hepburn: Kontorōra Pakku? ^ Japanese: 拡張パック, Hepburn: Kakuchō Pakku? ^ Japanese: 振動パック, Hepburn: Shindō Pakku? ^ Japanese: イラムト集 - ポストカード 1? ^ Japanese: イラムト集 - おもしろアクセサリー 1? ^ Japanese: キャラクター集 - ヨッシーストーリー? ^ Japanese: キャラクター集 - シルバニアファミリー? ^ Japanese: キャラクター集 - ボンバーマン? ^ Japanese: キャラクター集 - ゼルダの伝説 - 時のオカリナ? ^ Japanese: バスラッシュ - ECOGEAR Power Worm Championship? ^ Japanese: ぬし釣り 64 潮風にのって/ Nushi Tsuri 64 - Shiokaze Ninotte? ^ Japanese: 糸井重里のバス釣り No.1 決定版!? ^ Japanese: 電車 で GO! 64, Hepburn: Densha de Go! 64? ^ a b c d e "Nintendo 64 (video game platform)". Giant Bomb. Retrieved November 1, 2009. ^ Casamassina, Matt (February 23, 1999). "Nintendo 64 Mailbag". IGN. Archived from the original on July 19, 2007. Retrieved October 3, 2007. ^ "GB HUNTER Related Articles This is a list of accessories for t". Amazines.com. Retrieved May 12, 2010. ^ "Mantop!!! - Nintendo 64". Dinkacak.multiply.com. Archived from the original on February 14, 2010. Retrieved May 12, 2010. ^ Thomas, Lucas M. (January 30, 2007). "Mario Kart 64 VC Review - Wii Review at IGN". Wii.ign.com. Retrieved May 12, 2010. ^ Scott McCall (April 4, 2000). "Archive 64: Tony Hawk's Pro Skater - Nintendo 64 (N64) Review". Pennoaks.net. Retrieved May 12, 2010. ^ "Who Won the Videogame Wars of 1996?". Next Generation. No. 28. Imagine Media. April 1997. p. 17. ^ a b "Installing the Nintendo 64 Expansion Pak". Nintendo - Customer Service. Nintendo of America Inc. Retrieved November 1, 2009. ^ a b c d "Nintendo 64 Tech". Icequake.net. Ryan C. Underwood. May 17, 2007. Archived from the original on April 30, 2009. Retrieved November 1, 2009. ^ a b "Expansion Pak Games". Nintendo of America. Archived from the original on April 13, 2001. Retrieved January 11, 2014. ^ a b c d "Accessories". Nintendo 64. Nintendo of Europe. Retrieved July 21, 2014. ^ a b c Buchanan, Levi (October 29, 2008). "N64 Expansion Pak". IGN. Retrieved September 5, 2014. ^ Andre Segers (May 28, 2013). "Game-Breaking Bug is Why Donkey Kong 64 required the Expansion Pak". Retrieved May 6, 2015. ^ a b "GDC: Miyamoto Unveils Camera Connection". IGN. March 18, 1999. Archived from the original on June 10, 2001. Retrieved November 20, 2015. ^ "Nintendo Still Cooking Cabbage". IGN. April 4, 2000. Retrieved February 25, 2014. ^ a b IGN Staff (January 29, 1998). "64DD: The Games". Retrieved January 25, 2015. ^ Gantayat, Anoop (August 21, 2006). "Miyamoto Opens the Vault". IGN. Retrieved January 28, 2015. ^ "What's DT, you ask?". IGN. August 27, 1999. Archived from the original on December 20, 2004. Retrieved January 3, 2015. ^ Schneider, Peer (August 27, 1999). "Mario Artist: Talent Studio (Import)". IGN. Retrieved January 25, 2015. ^ "S-Video on PAL N64 (pics, details inside)". nfggames.com. ^ "Help with N64 svideo - overbright image". ^ "Any recommendations on an S-Video cable for SNES, N64, or GameCube?". digitpress.com. ^ "Nintendo Mouse". IGN. May 12, 1998. Archived from the original on April 23, 1999. Retrieved November 20, 2015. ^ IGN Staff (February 26, 1999). "DX 256 - Super Game Saver". IGN. Retrieved February 16, 2019. ^ "TremorPak Plus". IGN. March 3, 1999. Retrieved July 12, 2006. ^ a b "Mad Catz Gets Into N64 Act". Electronic Gaming Monthly. No. 86. Ziff Davis. September 1996. p. 17. ^ a b c "GamePro Labs". GamePro. No. 96. IDG. September 1996. p. 36. ^ "Multisystem Drivin'". Electronic Gaming Monthly. No. 95. Ziff Davis. June 1997. p. 22. ^ "Fuel-Injected Gaming". Electronic Gaming Monthly. No. 97. Ziff Davis. August 1997. p. 26. ^ "Flight for N64: InterAct First to Make 64-Bit Flight Sim Stick". Electronic Gaming Monthly. No. 88. Ziff Davis. November 1996. p. 22.